Last week I attended the inaugural O’Reilly Design conference, along with my Fluxible co-chair Bob Barlow-Busch. As with last fall’s trip to the CanUX conference, I’m always watching to see what works at a particular conference and thinking about how we might apply it to Fluxible. There was a level of logistical sophistication here that reveals O’Reilly’s years of experience running similar conferences and events. The program touched on user experience, industrial design, and graphic design, with standard mix of keynotes and breakout sessions. 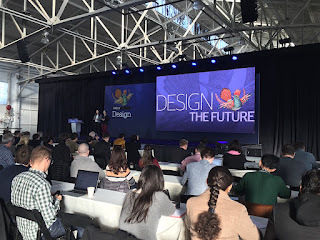 Highlights for me included a briskly paced vision of design from Erika Hall, a primer on effective critique from Adam Connor, and a call from Bob Baxley to bring more people into the design profession. The venue was Fort Mason Centre, with the main program happening in a cool warehouse space on a pier over the bay, and breakout sessions also happening in what appeared to be old army buildings. It worked well for me, even with a long and steep staircase to climb between buildings! Beyond the program, of course, there were many fine conversations with friends old and new.